Bond Economics: Should Breakeven Inflation Be Directional? Should Breakeven Inflation Be Directional? One typical behaviour seen in inflation-linked bonds is that their real yields (indexed yields) rise less than nominal bonds in a sell off. By implication, the breakeven inflation rate rises along with nominal yields; in market parlance, breakevens are directional with interest rates. I discussed this in a couple of earlier articles, and this article addresses some of the theoretical issues associated with this. In order to make this article self-contained, I will repeat some points. In particular, there are charts with data looking at the phenomenon in the first article. These articles will be assembled into a report on inflation breakeven analysis, and I am using these drafts as a form of brain-storming. Inflation Models: Are Central Banks Forward-Looking? For the purposes of my report, I wanted to avoid being dragged into discussing inflation models. Instead, the focus is to be model-agnostic, and only discuss the technical factors around the inflation-linked market. However, breakeven inflation directionality runs into a theoretical quagmire, which should be noted. 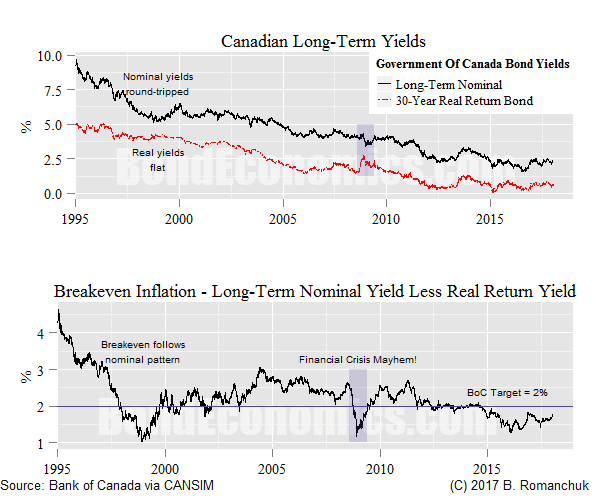 In the post-1990 environment, central banks have either explicitly targeted inflation (e.g., the Bank of Canada), or it is claimed that they have an implicit target (the Federal Reserve). International peer pressure led to a target of 2% inflation in the developed countries; targets that were largely hit during the period in question. (The Bank of Japan was an exception, however, one can interpret the Japanese experience as price level targeting -- the level of the CPI has been roughly stable over the period. Since the inflation target was hit historically, the straightforward extension is that we have evidence that governments can keep inflation near 2% if they wish to do so. Furthermore, unless there is a change in the policy stance, this argues that the "fair value" for a longer-term inflation breakeven rate is the 2% inflation target; whether or not there is a risk premium that should be embedded is another question. Importantly, this argument is somewhat theoretically neutral, so long as we do not assume that it is just central bank policy that leads to inflation remaining around the target. On one hand, it would be possible to argue that hitting the inflation target was the result of central banks targeting that outcome, which is the standard mainstream theoretical view. In this view, interest rates are set on a forward-looking basis, and expectations are paramount. Alternatively, one could argue that the historical post-1990 inflation outcome was the result of changes to the institutional structure of the labour market, a general reduction of the role in the government in the economy (a trend that started in the early 1980s), changes to trade policy, as well as less activist fiscal policy. In this view, central bank inflation targets were largely incidental; it may be that their only role was to help tip the economy into recession when it was coming close to overheating. In this view, interest rate setting is almost backward-looking: the central bank hikes (or cuts) rates in response to historical data. The key point is that it is very difficult to differentiate these two stories with the available data. A purely backwards-looking monetary policy would be enough to return inflation to target, under the relatively weak assumption that sufficiently high interest rates will cause enough stress in the private sector to induce a recession (and recessions are associated with a reduction in inflation). Although I do not wish to attempt to resolve the debate between these two classes of models, the theoretical difference shows up in the behaviour of (long-term) breakeven inflation. If we want to believe mainstream stories about inflation expectations, the evolution of the real rate of interest and the breakeven inflation rate ought to be fairly independent of each other. For example, if the central bank raises the nominal rate of interest, it is doing so to keep inflation expectations stable, and so the breakeven inflation rate should be unchanged. There should be little correlation between nominal interest rate changes and breakeven inflation changes. If the central bank only moves interest rates in a manner that reacts to past data, stronger data implies both a higher nominal rate and a higher expected inflation rate. This because the stronger data implies that inflation will rise further above target before the central bank can induce a recession to correct it. That said, the ability of breakeven inflation to diverge from target is limited, and so we cannot use a constant multiplier to predict breakeven inflation changes from nominal interest rate changes. As an immediate technical note, I will note that no credible commentator believes that developed country central banks can target the price of oil. Oil price shocks mechanically lead to changes in the headline CPI, and so we should expect deviations of short-term breakeven inflation under almost any plausible theoretical framework. These oil price shocks will propagate to longer inflation breakeven tenors, but the effects should be much smaller than observed breakeven changes. It should be noted that observed prices are based on market participants' expectations; there is nothing stopping their forecasts from being wildly wrong. In this case, the implication is that observed directionality can be viewed as the weighted average of market participants' implicit inflation models. Since those implicit models can change, it is entirely possible that the observed directionality pattens will also change. My bias is that indexed yields will rise less than nominal yields in a selloff. However, it should be noted that this behaviour is not predicted by all inflation models, and there is no guarantee that market participants will follow the same patterns that they did historically.